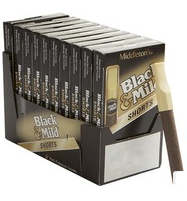 Black & Mild Shorts Wine Cigars pack 10/5's and Upright 25's | Black & Mild Wood Tip Cigars - Black & Mild Cherry Cigars - Black & Mild Cream Cigars - Black & Mild Mild Cigars - Black & Mild Shorts Cigars - Black & Mild Apple Cigars - Black & Mild Jazz Cigars - Black & Mild Wine Cigars - Black & Mild Royale Cigars - Black & Mild Casino Cigars and Black & Mild Filter Tip Cigars. Black & Mild Shorts Wine Cigars pack 10/5's and Upright 25's is a pipe-tobacco cigar made from an entirely unique recipe and blend of Middleton's finest tobaccos. The combination produces a pipe-tobacco cigar that tastes great and smells great! 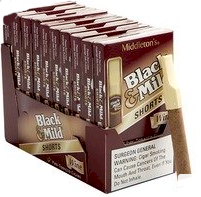 Black & Mild Shorts Wine Cigars pack 10/5's and Upright 25's are of the aromatic old-fashioned appeal of a pipe flavored tobacco without the cleaning. Black & Mild Shorts Wine Cigars pack 10/5's and Upright 25's are in 10 packs of five (50 cigars total) or in an Upright Box of 25 cigars. Black & Mild Shorts Wine Cigars pack 10/5's and Upright 25's featuring a famed name in fine pipe tobaccos, Black & Mild Shorts Wine Cigars pack 10/5's and Upright 25's machine-made cigars are manufactured right here in the USA with premium pipe tobaccos built into a slim 5 x 30 size perfect for the shorter cigar break. 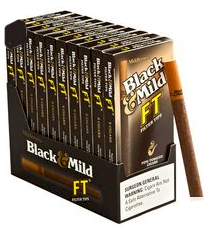 Black & Mild Shorts Wine Cigars pack 10/5's and Upright 25's provide a mellow strength profile, Black & Mild pipe-tobacco smokes are always an easy and economical option when shopping online to buy engaging and aromatic machine-made cigars featuring fresh and fruity flavor.